MamaNatalie is a birthing simulator designed for training both normal delivery and postpartum complications, including severe bleeding, uterine atony, and retained placenta. With realistic bleeding, MamaNatalie is a useful complement in postpartum hemorrhage trainings programs, such as Helping Mothers Survive Bleeding After Birth Complete. MamaNatalie gives birth to NeoNatalie, a highly realistic newborn simulator. MamaNatalie comes with NeoNatalie newborn simulator. NeoNatalie has a realistic size and appearance. 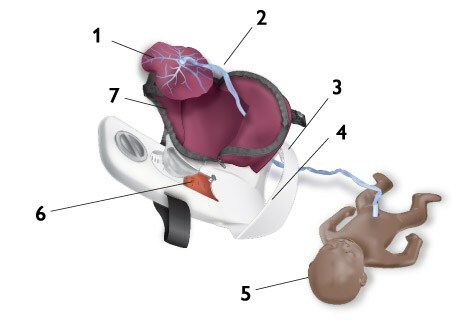 NeoNatalie was developed to meet the key requirements for teaching the initial steps of resuscitation in the first ten minutes of a newborn's life. In a randomized controlled trial of birth simulation for medical students, MamaNatalie was found to be as effective for training medical students on how to perform a vaginal delivery as a high-end simulator. Additionally, a pre and post study in Tanzania showed that MamaNatalie was effective in enabling multi-professional, scenario-based training, which was associated with a significant 47% reduction in whole blood transfusion rates. These results suggested that training that included all levels of maternity staff, repeated sessions with realistic scenarios, and debriefing may have contributed to reduced blood transfusion rates in this high-risk maternity setting. Umbilical cord: Connects to baby simulator. Palpable pulse. Cord complications. MamaNatalie gives birth to NeoNatalie, a highly realistic newborn simulator. NeoNatalie has realistic size and appearance, and also natural weight, feel and touch when filled with lukewarm water. Blood tank: Takes up to 1.5 litres. Valve for regulating bleeding intensity. Scale for measuring total blood loss. Uterus: Contains baby, placenta and umbilical cord. Controllable uterine firmness, from atonic to fully contracted.